Dear Friends, I have had people come to me in the last few months asking me how I am able to travel and minister without receiving an offering in the nursing homes. It's obvious that within the walls of nursing care facilities we are not able to receive offerings. It is also true that none of the nursing facilities pay me anything to come. I am a "volunteer". Since this is what I do full-time, it's obvious why this question would come up. The reason I did not start this ministry when I should have is for this very same question. I asked the Lord, "How can I do this? Where will the money come from?" When I realized that it was God who was calling me to do this, I saw that it was faith in Him that would meet my needs. Over a period of a few years, I received 3 verses from the Lord that I continually look at: Matt. 4:19, Luke 4:19, and Phil. 4:19. When these verses are read together they read like this: Follow me and I will make you fishers of men - to preach the acceptable year of the Lord, the day when salvation and the free favors of God profusely abound - and my God shall supply all your needs according to His riches in Glory by Christ Jesus. Many times, toward the end of a year and into the next year, we look at our charitable donations for possible changes. If you are looking for a ministry to partner with, we say, "welcome home". 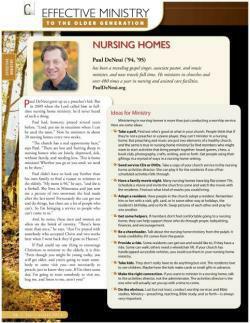 Together, let's watch the power and love of God do a might work in the lives of nursing home residents and staff. Ann and I are thankful to each and every supporter. We pray for them daily. We call them "Life Senders". Jesus said in John 10:10, "I am come that you might have Life . . ." Together, we are sending life into nursing care facilities. 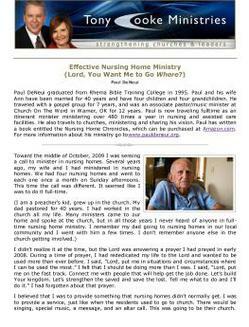 The articles below are written by other ministries verifying the credibility of Paul DeNeui Ministries.